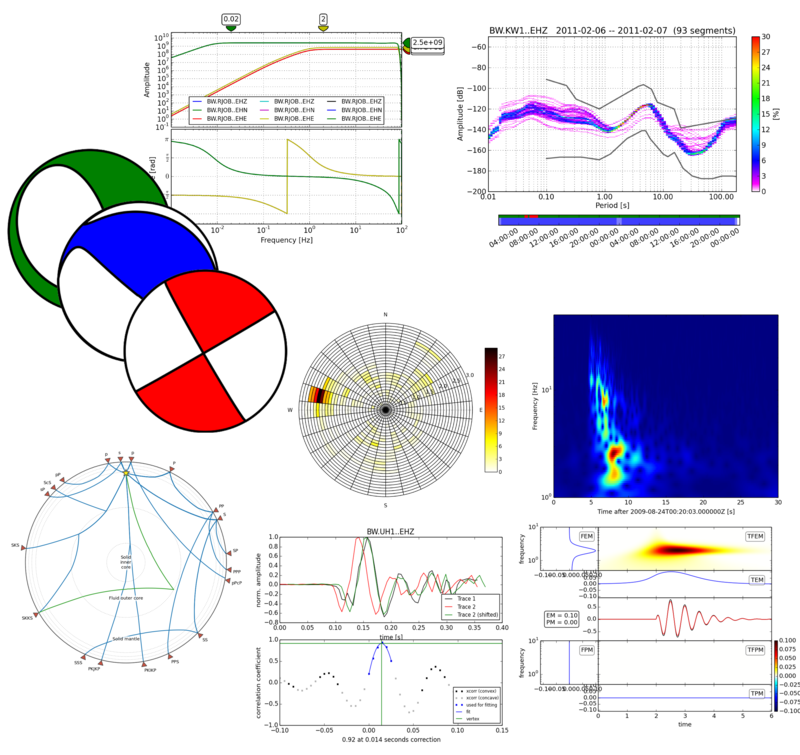 In this very short introduction to ObsPy we will see how we can start from scratch to acquire time series data (aka waveforms) of the ground shaking resulting from earthquakes, recorded at seismometer stations. Many global seismometer recordings are free to be downloaded by everybody. We will also see how these data can be handled in Python using the ObsPy framework. Again, please execute the following cell, it contains a few adjustments to the notebook. local files can be read using the readEvents() function. local files can be read using the read_inventory() function. # adding/subtracting seconds to/from an existing timestamp object. trace.data (the raw time series as an numpy.ndarray) and..
# pointers to the array in memory can be passed to C/Fortran routines from inside Python! local files can be read using the read() function. # attach the instrument response to the waveforms.. This example prepares instrument corrected waveforms, 30 seconds around expected P arrival (buffer for processing!) for an epicentral range of 30-40 degrees for any TA station/earthquake combination with magnitude larger 7.
a) Read the event metadata from local file "./data/events_unterhaching.xml". Print the catalog summary. b) Take one event out of the catalog. Print its summary. You can see, there is information included on picks set for the event. Print the information of at least one pick that is included in the event metadata. We now know one station that recorded the event. c) Save the origin time of the event in a new variable. Download waveform data for the station around the time of the event (e.g. 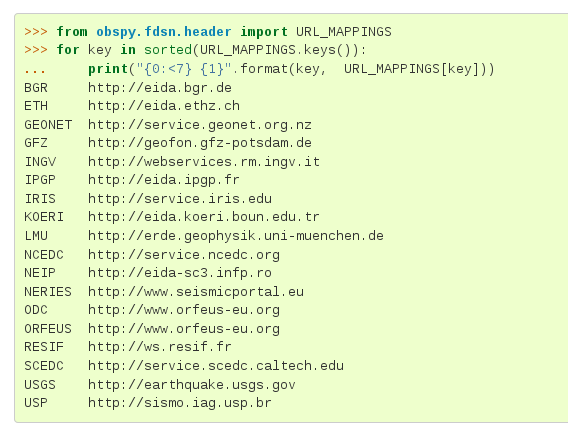 10 seconds before and 20 seconds after), connecting to the FDSN server at the observatory at "http://erde.geophysik.uni-muenchen.de" (or read from local file ./data/waveforms_uh1_eh.mseed). Put a "*" wildcard as the third (and last) letter of the channel code to download all three components (vertical, north, east). Plot the waveform data. d) Download station metadata for this station including the instrument response information (using the same client, or read it from file ./data/station_uh1.xml). Attach the response information to the waveforms and remove the instrument response from the waveforms. Plot the waveforms again (now in ground velocity in m/s). e) The peak ground velocity (PGV) is an important measure to judge possible effects on buildings. Determine the maximum value (absolute, whether positive or negative!) of either of the two horizontal components' data arrays ("N", "E"). You can use Python's builtin "max()" and "abs()" functions. For your information, ground shaking (in the frequency ranges of these very close earthquakes) can become perceptible to humans at above 0.5-1 mm/s, damage to buildings can be safely excluded for PGV values not exceeding 3 mm/s.